Warren Buffett, the legendary investor and chairman and CEO of Berkshire Hathaway (NYS: BRK.A) (NYS: BRK.B) , announced this afternoon that he has stage 1 prostate cancer. (Read Buffett's letter here). Buffett, 81, describes his condition as "not remotely life threatening or even debilitating in any meaningful way." Buffett's doctors discovered signs of the condition during a routine checkup; they have decided on a 60-day treatment program of daily radiation. Buffett says the treatments, which will begin in mid-July, will restrict his travel but won't otherwise affect his daily routine. Presumably, this means that Buffett still intends to participate in Berkshire's upcoming annual meeting, which is attended by tens of thousands and widely lauded as "Woodstock for Capitalists." The jarring news sent shares of Berkshire down around 2% in after-hours trading. 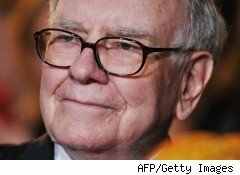 At the time this article was published Joe Magyer wishes Warren Buffett a speedy recovery. Joe owns shares of Berkshire Hathaway, as does The Motley Fool. The Motley Fool has a disclosure policy.